Volvo’s entries for this festive season are its hot selling models, the S60 sedan and the XC60 crossover. Both these cars have got minor facelifts with a cosmetic makeover and a few additional features. 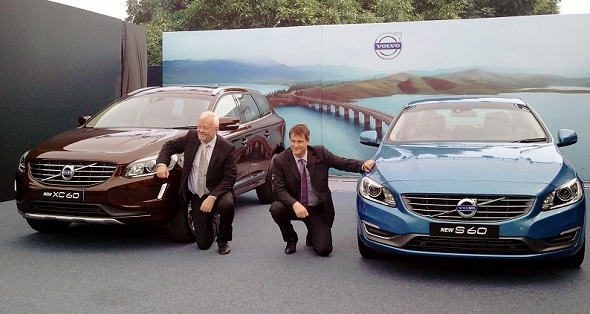 Engines and transmissions wise, the facelifted models of the S60 and the XC60 retain the D4 and D5 turbo diesel units. The D4 turbo diesel engine is a 2 liter-4 cylinder unit that pumps out 163 Bhp-400 Nm while the D5 turbo diesel engine is a 2.4 liter-5 cylinder unit that outputs 215 Bhp-420 Nm. Both engines come with 6 speed manual gearboxes. The engines power the front wheels of the S60 and all four wheels of the XC60 variants through an all-wheel drive system.